To say I love my son is an understatement. As the years of him growing up have literally flown by, I knew that there was some way that I had to “freeze” time, even if for just a short blip, to capture my emotions that I’m feeling. 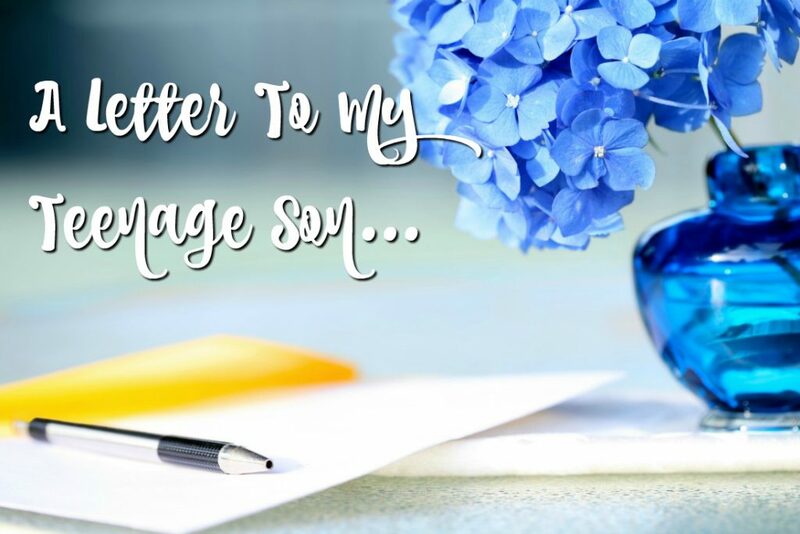 This thought and feeling is how I was able to write a letter to my teenage son…and even though he technically isn’t a teen anymore, the words still ring true no matter how quickly he is again. In my eyes and heart, he will always be my little boy! How does your son or daughter inspire you? People always ask me why I decide to write this letter instead of just telling these things to him instead. Spoiler Alert: I’ve done both. To me, writing out this letter means that it remains, forever. While words are wonderful and I’ve verbally told him these as well, it’s just a small matter of time before they escape his thoughts and are just a memory of the past. But this article? This letter? He can come back over and over again, literally for forever, and read these words that will always be true in my heart. These words that I wrote to my son will never be erased. On days when he’s struggling or needing a positive thought, he can literally come to this post and read these words. What a great gift to give! As a mom, I only want the best for him. He’s been a light in our lives since the day he was born and he continues to be a leader and amazing role model as he’s grown. If this one letter can continue to be a positive memory in his life when he thinks about growing up and his family, I’m beyond happy to imagine that smile. Don’t delay. Tomorrow isn’t promised and the time is now to show them how much they mean to you. Type up on email, hand write a letter and send it in the snail mail, or send them a quick text…A simple gesture that they can keep forever will mean more to them than you’ll ever realize. Here we are, you are almost eighteen years old! It seems like just yesterday I was changing your diapers. Today, you literally hop in your own car and do your own thing. You are a teenager. You are are a Senior about to graduate. In no time, you will be going off to college and eventually starting your own family. To this day, I cannot believe how fast time has flown. When I close my eyes, I can picture you like a baby boy. You were literally the sweetest baby that ever graced the earth. I wanted to tell you I believe you are going to do amazing things in this lifetime. You may not always do things the way I want you to, but you always do the right thing. I’m incredibly proud of you and everything you stand for in life. Juggling a job, college coursework plus high school and helping me around the house is hard to do but somehow you manage to do it all so well. You always know how to make people smile. Your personality and positive outlook on life is something I really admire in you. You always make everyone feel special. It is amazing seeing you as your own person. This little human that I grew inside of me, is now on the outside doing amazing things in this world. I love seeing your passions and dreams come true. You may be a teenager, but you inspire me every day. As a teenager, you’re still an awesome role model for your sisters. They look up to you! You prove every day that you were meant to be their big brother. I love watching you be protective of them and be there for them. Seriously, they are so lucky to have you! I am super proud of you and everything you are! It may have been a lot of work when you were little, but now you are out there becoming the young man I always hoped you would be. I look forward to your life ahead of you and watch you GO BIG! Take the time to write the letter and let them know just how you feel! Your children are the greatest gifts in life, ever, and giving them words of happiness that they can always have is one gift that they will cherish forever. Time sure flies. I keep asking our son NOT to get any bigger than six years old. But he’s growing every minute. This summer he grew like a weed! Love your blog, Winona. It’s very informative for the whole family and very easy to navigate. Hope to be visiting your blog often. Thank you ? Children are a blessing and time certainly flies by! Thanks for sharing that! God bless your son in whatever he chooses to do! I’ve never seen the big pouches, but I think they’re a great idea, thanks for sharing! What a nice letter to your son. I feel the same way about my son. There is so much fun raising a boy and family is everything! He looks like a fine young man, congrats! Thanks for posting! A lovely letter from a very proud mama. How did he get to be so tall? WHAT A BEAUTIFUL FAMILY AND A AMAZING LETTER. How beautiful! I look at my sweet 5 yr old son and pray that time will just stop! But I know the blessings God has in store for the future, my son might not always take the path I expect but I hope that he will take the path God has for him. This is beautiful! I’m sharing with my bestie who has a son about to graduate. You are such a wonderful mother Winona! Your son is very handsome & this was very sweet of you to write!! I’m sure all your kids & grand babies just adore you & love you!